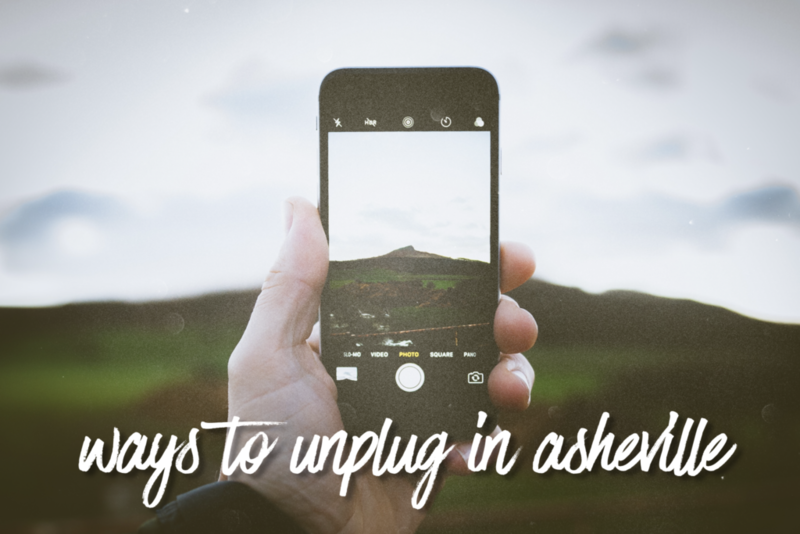 Are you looking for ways to unplug in Asheville? Maybe you’re visiting for business or pleasure and just can’t get away from the devices. Are you a local who can’t find anything else to do but peruse social media? We’ve put together a list of things Asheville offers that would be a great substitute for all that arguing with people about politics on Facebook! Sit by the fire at the Grove Park Inn. Cozy up on a comfy chair or couch in front of the grand fireplace in the lounge area of the Grove Park Inn. Sip on a hot chocolate or hot buttered rum! Soak in the rustic elegance of this mountain resort. Stay as long as you want and catch up on some reading or just relax and unwind. Unplug in our quirky city by thinking outside of the screen! Asheville is known for its gorgeous hiking trails and scenic overlooks on the Blue Ridge Parkway. Grab some take-out pizza from one of our fabulous pizza joints (All Souls or Fresh Wood Fired are good choices.) Snag a bottle of wine and drive to Craggy Gardens off the Blue Ridge Parkway. There is a grassy area perfect for laying a blanket down and gazing at the 360-degree views offering spectacular sunsets. Explore the cuisine of Asheville! Unwind at the Southern Kitchen and Bar. Treat yourself to some champagne after a long day of hiking or sightseeing. On Wednesdays, The Southern Kitchen has a $3 champagne drink special all day. Spend the late afternoon in this charming quiet little bar and snack on some appetizers before you head out for an evening on the town. Unplug by allowing your creative side to come out in a relaxing atmosphere. Paint a piece of pottery, create a mosaic piece, or fused glass art and jewelry at Fired Up! Creative Lounge. You can’t scroll through Instagram when your hands are covered in glazes! There is something incredibly soothing about spending time alone or with some friends allowing creativity and fun to come to the surface. What better way to completely unplug? Asheville is the hub for meditation, offering all kinds to try as a way to go within and access your own peace and happiness. Transcendental Meditation, Asheville Meditation Center, and Asheville Insight Meditation are just a few of the places you can go learn to meditate in a zen atmosphere while you soak in the healing energies of Appalachian Mountains. There are endless ways to unplug in Asheville–these are just some options. Have ideas of your own? Leave us a comment so we can share with everyone!